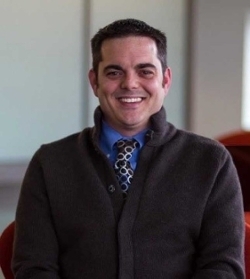 Eric Raider, Associate Director of Student Engagement at the Kelley School of Business, has been a study abroad advocate since his days as an academic advisor. ﻿Raider received an undergraduate degree in Marketing at the University of Indianapolis (UIndy) and a graduate degree in Higher Education and Student Affairs from IUPUI. 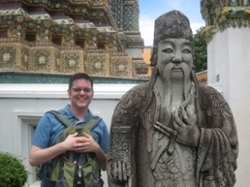 Although he was not able to study abroad during his undergraduate year at UIndy, Raider had the opportunity to go abroad as a graduate student. The program was for three weeks in Bangkok, Thailand and Raider took it as an elective for his degree. The program was tailored towards graduate students and focused on the Thai higher education system. While most students in the program worked in groups as consultants to Thai universities, Raider worked with the business faculty at Chulongkorn University during a time when their school of business was going through accreditation. "My experience was humbling. I was the only student who travelled to their site alone and it was awesome! I was out of my element every day and got lost going to the Chula University EVERY DAY (except for the final week). I was OK with it because this was part of my experience. I did not speak Thai and there was something magical about being a "foreigner" in a strange and exotic land. It forever changed my view of the world and what my role is," Raider said. The benefits of studying abroad can include personal growth, career attainment, and even language skills. Raider believes that there are two reasons studying abroad is beneficial, "First is the academics" and "Second, learning more about who you are.” According to Raider, studying abroad provides learning experiences that are not available in the classroom and that students learn more about themselves when in an unfamiliar environment, not to mention the skills that are gained. “The communication skills are the given. What happens "in secret" are the critical thinking skills. You might not know it at the time but being abroad and in that vulnerable space is teaching you those valuable skills,” Raider said. Every year we have an increasing number of students interested in studying abroad. Some students are encouraged to apply to programs by their professors, advisors, and other students, but all have the same question, “Where do I start?”. Some advice from Eric Raider for students: Ask lots of questions…I mean lots about studying abroad and what programs are offered at IUPUI and other IU campuses. Then meet with an academic to determine where the program fits into your degree. Finally, MEET WITH CAREER COUNSELORS WHEN YOU GET BACK!!! This is more than just a "class".